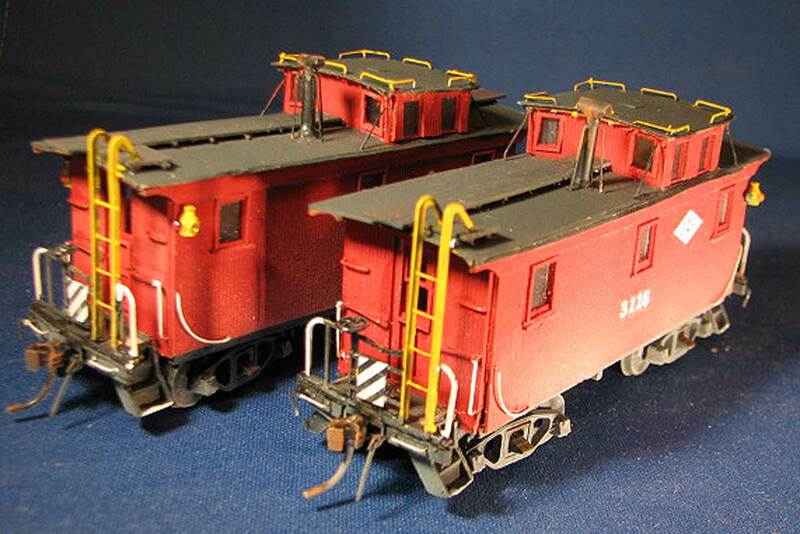 I just completed and photographed two cabooses for my home road. These are laser-cut wood kits made by Monroe Models. I really do not like working with wood kits and am not satisfied with the finish you tend to get with these. 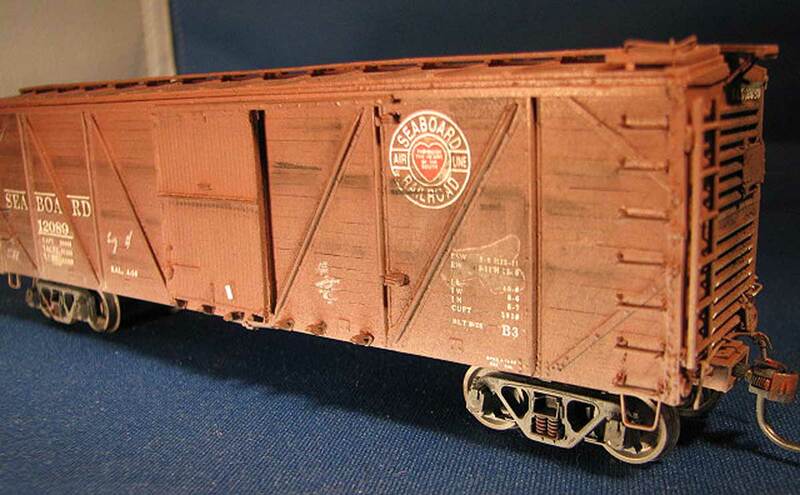 The prototypes for these kits are Duluth Missabe & Iron Range cabooses and a variation of the prototype is offered by Walthers as a plastic car. 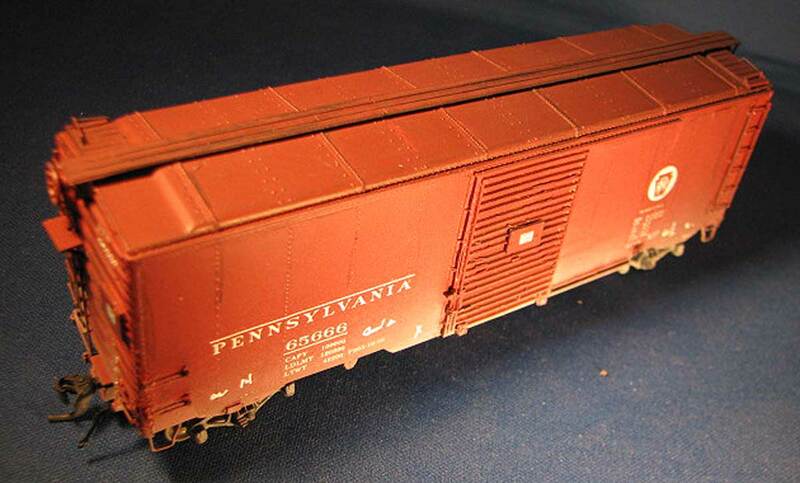 Some time ago Ben Hom posted a question to your blog regarding the Pennsylvania Railroad car class with what I called a “semi-Turtleback” roof. Well, I finally came across the box the car was hiding in and photographed it. It turned out to be an X37, Sunshine kit 44.1. The PRR also had a four-door version of this car, class X38 as I recall. In addition to the roof, the side sill tabs are also quite unusual. The Norfolk & Western B-4 automobile cars had a similar roof profile. I have never seen this type of roof on any other house cars. I assume it was an interim design to fit a clearance diagram. 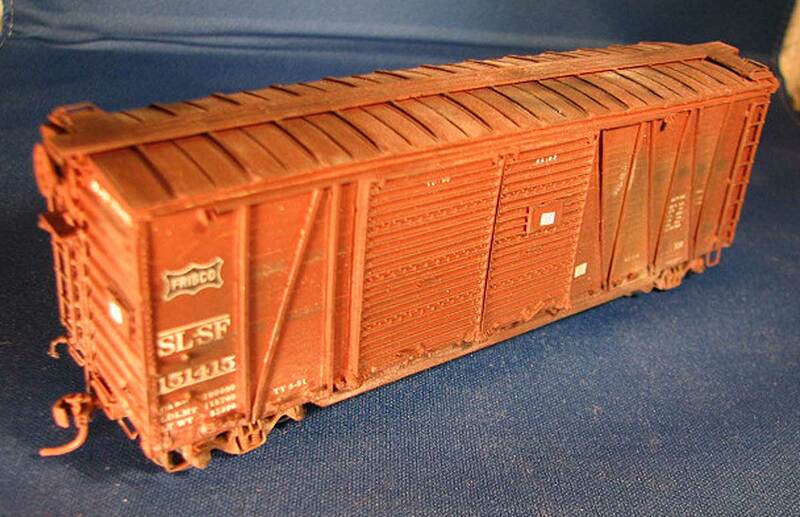 Wright Trak released a couple of kits for the SAL ventilated box car. I was finally able to obtain a kit of the V-10 version from the Coast Line Historical Society company store and recently finished the car. These were very interesting prototypes and an enjoyable build. I chose to build it as in general freight service as my other ventilated cars are in produce service. The weathering was done with a light spray of Floquil dust followed by light dusting/streaking with Pan Pastels. 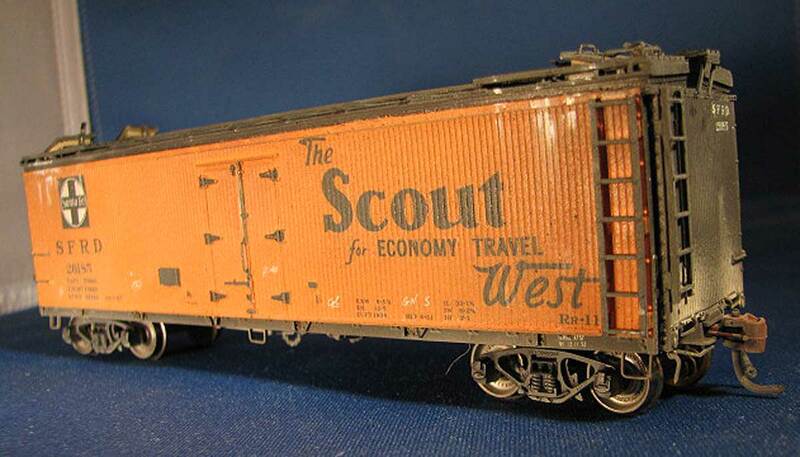 The chalk marks were part of the decal sheet supplied with the kit. Pacific Fruit Express 9879 is Sunshine kit #72.7. The model follows the prototype PFE R-40-26, a post-war steel plug door car. I built this to represent a 1951 build, so it would be a fairly new car on my railroad. 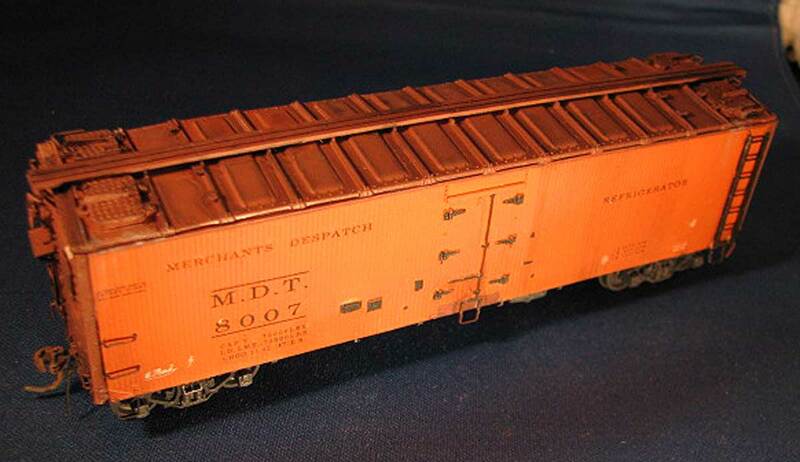 Merchants Despatch Transportation 8007 is also a Sunshine kit, # 20.1. It is a composite reefer, dating from 1941. This design was also used for some NRC cars. I built this one some time ago. St Louis – San Francisco (SL-SF) 151415 is Sunshine 81.6 and is another example of my fondness for 40′ single-sheathed cars. This one features a larger left hand door over a 13-foot opening, 10-foot interior height, radial roof and Dreadnaught ends. The design dates to 1926 (150000-series), while the 151000-series is a 1928 add-on order for 500 additional cars. Starting in 1939, rebuilding began which resulted in several different configurations of single and double door cars. Eventually, some of the cars received steel sheathing. This model represents a late rebuild that retained its wood sheathing. Martin Lofton’s data sheet shows that there were still over 1300 of the original 1500 cars still in service! MoPac and MKT had similar cars. 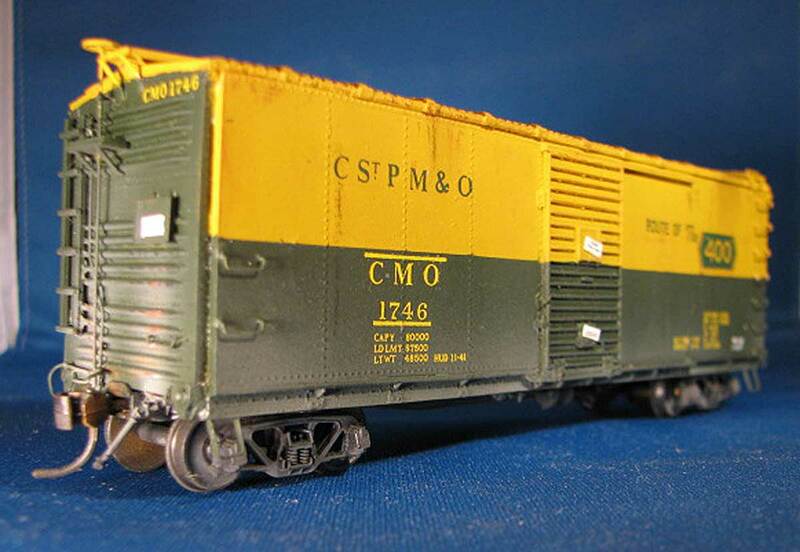 Chicago, St. Paul, Minneapolis & Omaha (CMO) 1746 is Sunshine kit 2.4, which I acquired in 1989. 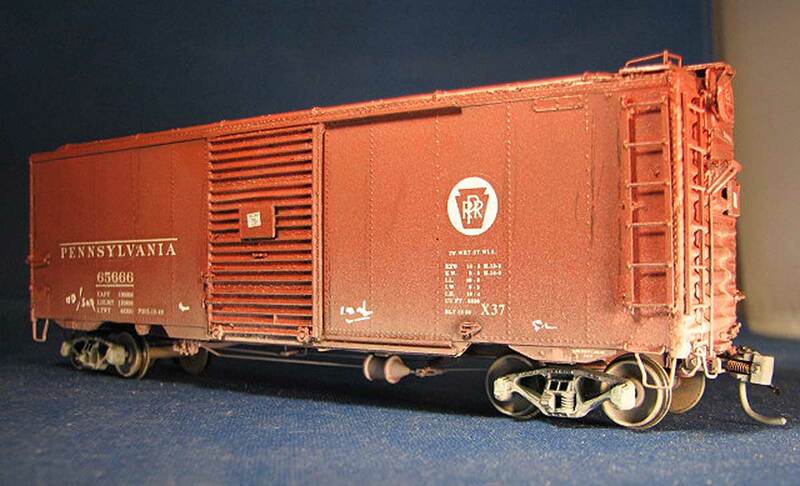 It is a USRA rebuild with the IH extended to 10’1″. Evidence of this can be seen by the flat patch panel placed between the Murphy end panels. The rebuild date is 1941 for this one, but I suspect the snazzy green and yellow paint scheme is a later modification. I cannot locate the history sheet for this one, so I cannot confirm at this time. In addition to the added height, it is interesting to note that these cars retained the stem-winder brake wheel although they received AB brakes when rebuilt. Santa Fe Refrigerator Despatch (SFRD) 26185 is Sunshine kit #16.2 purchased in 1991. This car represents an SFRD Rr-11 class. 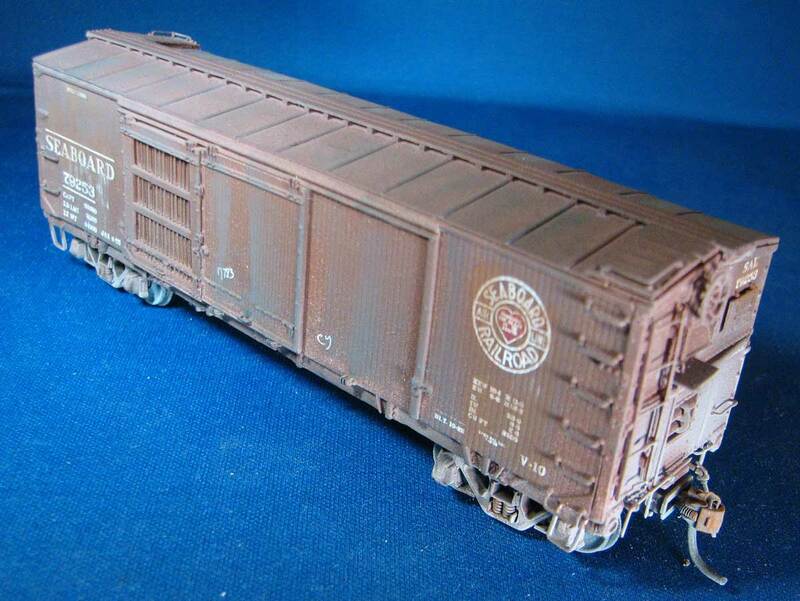 This is the last of the wood sheathed reefers purchased by the Santa Fe and they were based on an ARA design. Pullman and ACF were the builders of the series Rr-5-11.The first of these arrived in 1927 as class Rr-5. Over the years, many of these reefers were rebuilt, but 26185 represents one of the 315 Rr-11 cars that escaped rebuilding into 1953, although it did receive a new steel roof sometime after 1938. This is a flat kit and it went together without any problems. It wears the Santa Fe straight line map on the opposite side. ATSF 63710 is Sunshine kit #22.2. It is a Santa Fe Fe-12. Originally Built by ACF between 1910 and 1914 as class FL, N, and O cars, these box cars were rebuilt between 1936 and 1939 into Fe-5, 12, 15, & 19 classes. 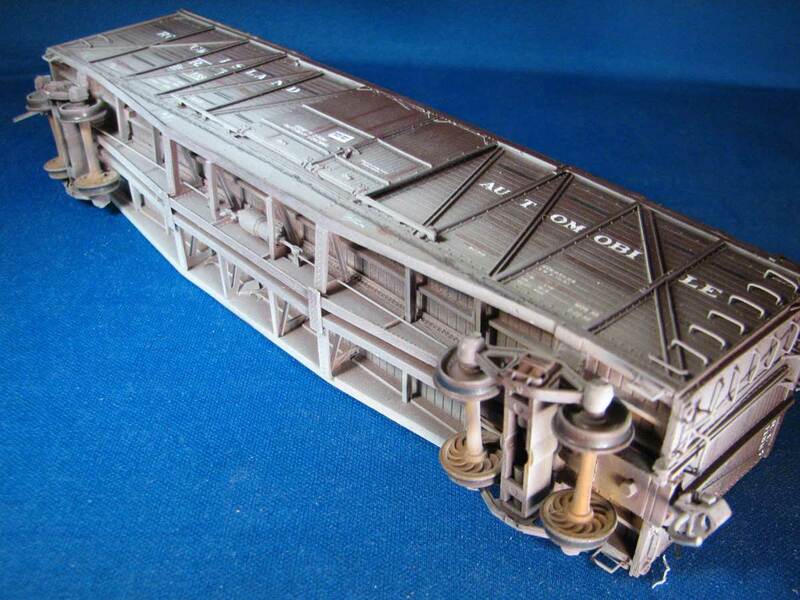 The Fe’s retained the four fishbelly underframe and exposed bolster end. The rebuilding process utilized ends and end pieces from scrapped cars which often resulted in a car with different ends, as the 63710, or ends with various patch panels. 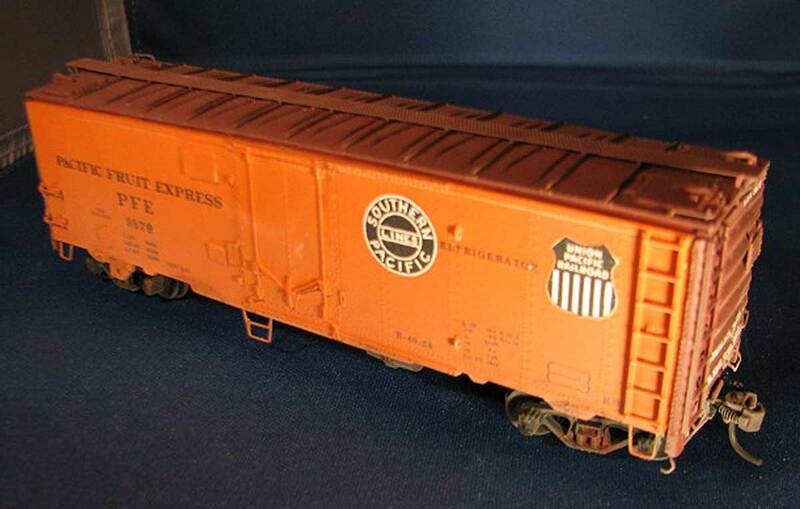 Some of them later received end doors to carry aircraft parts, but most were assigned to general box car service to finish out their lives. This one might be a good scratch-build project to clean out your odd scrap parts box! 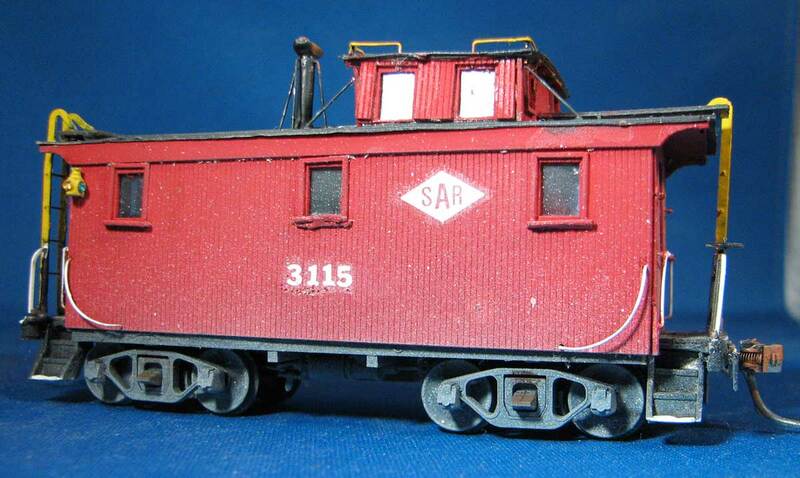 Bangor & Aroostook (BAR) 1106 – Sunshine did a series of kits based on the 1923 ARA XM-1 design. Kit 91.3 is the BAR version after rebuilding in the 1950’s.The 1106 received steel doors but retained its vertical brake staff and Pratt side bracing, keeping much of it’s original appearance. It is a typical XM-1, if there is such a thing. The model has flat steel panel ends and a Hutchins metal roof. The BAR owned 600 of these. 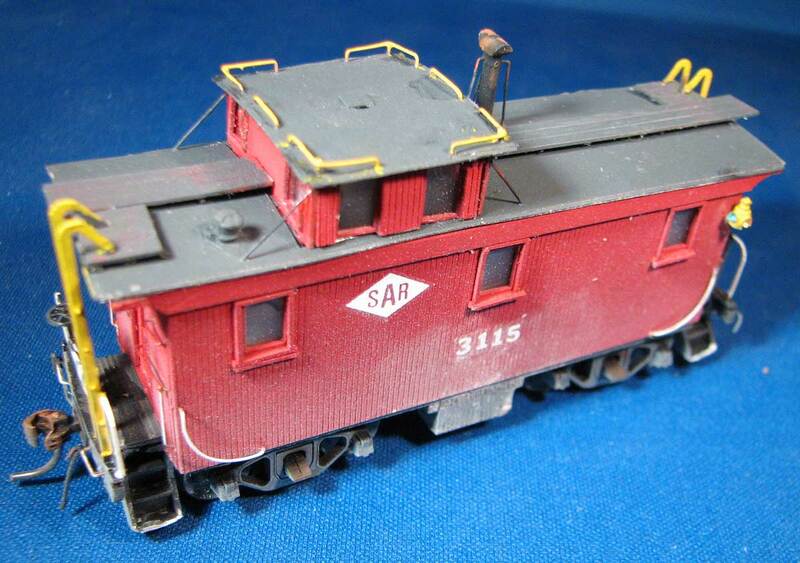 Seaboard Air Line (SAL) 12089 – Sunshine 91.8 is a class B-3 (1000 cars). These had Murphy ends and a metal clad roof and were built in 1926. SAL 16816 is a B-5 Class (2000 cars) from 1930 (Sunshine 91.10). These had flat panel ends and lap seam roofs and unusual Dalman-Andrews trucks. I modified Tahoe Andrews trucks to make these. The SAL got 4345 cars in four classes that were similar to the XM-1 design. However, the SAL used a shallow fishbelly underframe and, therefore, these technically were not true XM-1’s. Many other roads owned XM-1’s but, each road had different preferences for roofs, ends and doors, so that each road’s cars retained an individual appearance. 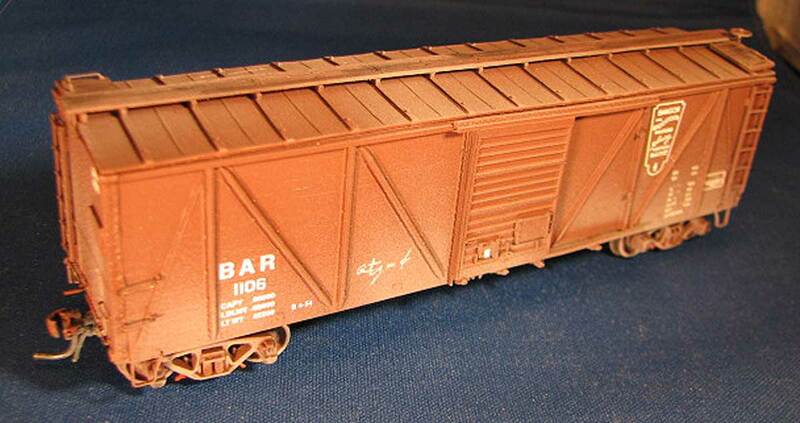 Still, the XM-1 can be considered to be the standard box car of Eastern railroading in it’s time. 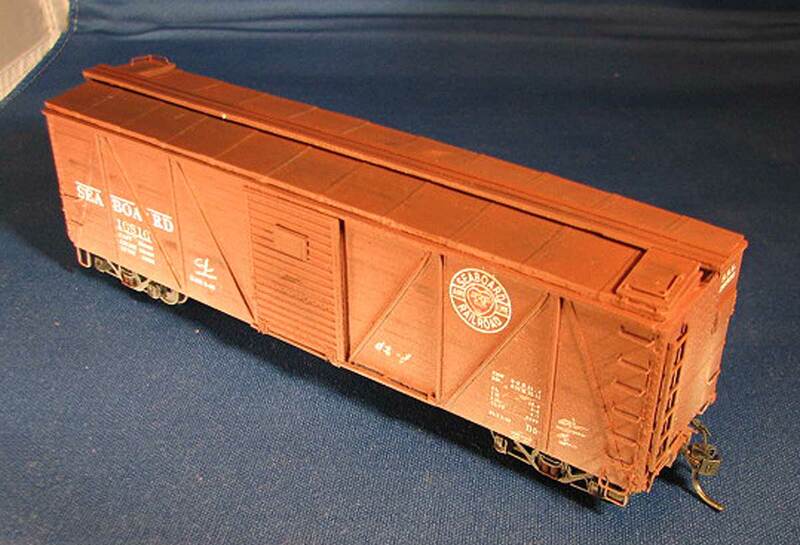 Here is an example of what I consider to be the world’s ugliest box car. This is an old Westerfield flat kit that was cast in the old, brittle resin. I think the Rock Island threw away conventional rules in box car construction for this one. 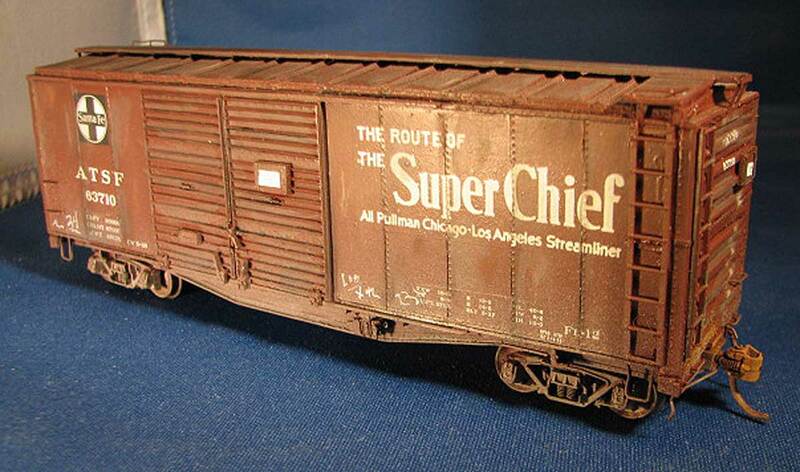 I cannot locate Al’s history sheet, but it must date back to the days of evolving freight car design. In spite of its uniqueness, this Edsel of boxcars had a long life. I don’t recall having any great difficulties in assembling this kit and the old resin has not required any repair. I haven’t even dropped it on the floor – yet. Ugly, or not, it is still an interesting car. I’ll send along a few more as time permits. Enjoy! I hope you enjoyed this virtual RPM presentation. There are several Railroad Prototype Modeler events ahead on the calendar and I encourage you to attend one and experience the presentations, model displays, and meet other prototype modelers. Here are the upcoming RPM events. As usual, thanks for visiting the blog. Your questions and comment can be posted below. Please follow the instructions so your comment can be posted. All comments are reviewed and approved before they appear.